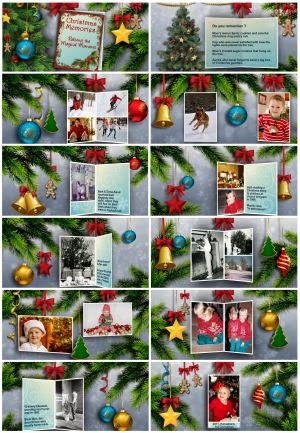 Share your favorite memories of Christmas past, and your special family photos, with this festive pack of effects. and, of course, many, many Christmas ornaments, that you can use to create even more slides. You can choose to use either the template or the styles, whatever you find easier. This pack makes use of text layers, and because of this it can only be used with Producer 6 and above. Many thanks to my two friends from the States who shared with me, and with you, their Christmas memories.